I would have to say that 75% of our business at the bakery are wedding cakes; the other 25% are celebration cakes. Last year, one young man was celebrating his Bar Mitzvah: his theme? ‘Under the Sea’. Not your Little Mermaid ‘Under the Sea’ mind you – but a literal take on ‘Under the Sea’. It’s always fun to hear these meetings; remember my desk is in the same area where Ron meets clients, so I hear all sorts of things. These kinds of cakes are a collaboration between child and artist and it’s fun to hear Ron and the client both get excited about an idea. It gets even better when we sit down for a production meeting and present the idea to the staff. They never look at Ron and tell him, “We can’t do this.” They always rise up to the challenge and they do it well. Every time we execute a cake like this, there is always a new technique they have figured out. One of our artists actually names objects when she is working on them for a more personal connection to the work or just for the fun of it. 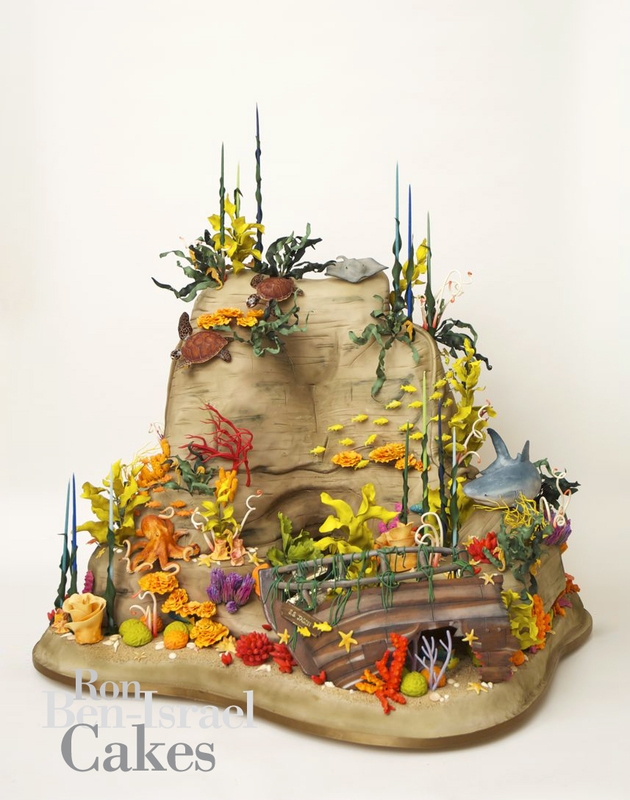 So enjoy this ‘Under the Sea’ themed cake. The details are exquisite and our staff really had fun making this cake.